When stress isn’t properly managed, it comes with a cost. It’s linked to depression, hair loss, obesity, and other poor health outcomes. It’s especially present for the under-30 crowd and is a large part of work and home life. According to a Statista survey, 62 percent of adults under age 30 associated stress with their daily lives, while 43 percent linked it to work. Those over 30 aren’t far off either: about 55 percent of adults ages 30 to 59 and 46 percent of adults 60 and older believe stress is part of their daily lives. 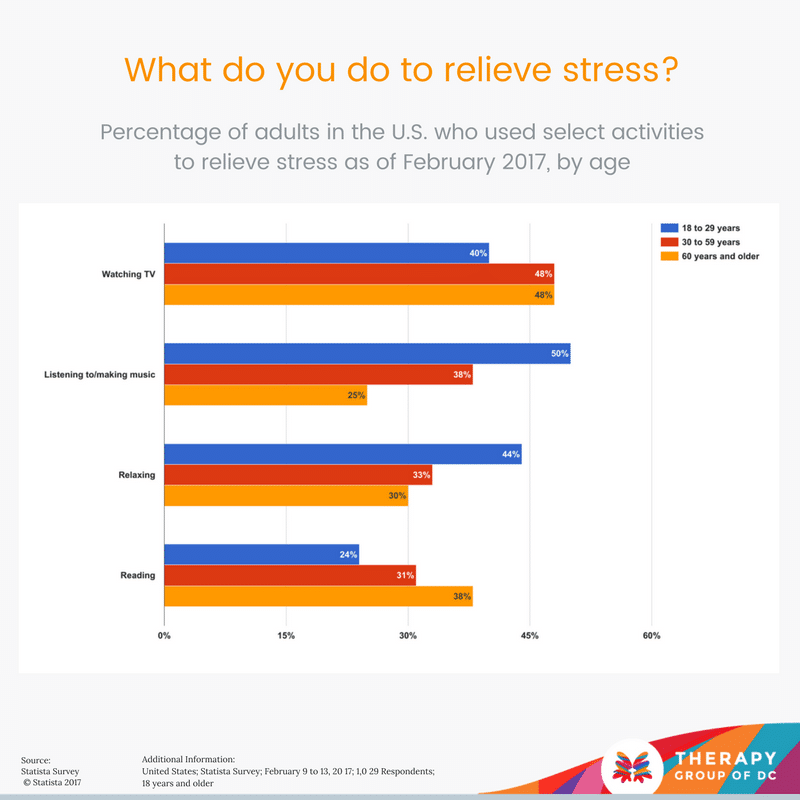 Moreover, life stress and work stress and burnout cause unhealthy behaviors and disruptive symptoms for one-third or more of U.S. adults. When left unchecked, it can lead to four disruptive symptoms, including irritability and anger, nervousness or anxiety, depression or sadness and constant worry. People most commonly use the TV for stress relief. However, what you’re watching may play a role in its effectiveness. For instance, one study shows that watching reruns can be a helpful way to recover after a stressful situation. The idea is that TV characters and fictional worlds offer a non-obligatory way to connect that is less stressful than real-life situations. Age plays an interesting role when it comes to stress relief, too. Individuals in the 30-plus crowd enjoy watching TV while people under 30 are drawn to creating and listening to music and relaxing stress-relief methods. Listening to (or creating) music can help reduce stress by reducing anxiety, your heart rate, and blood pressure. Create an upbeat playlist or songs to get you motivated or moving to relieve stress. Also try making music or creating playlists with calming, natural sounds, such as ocean waves, as a relaxing stress relief mechanism. Relaxing can come in a variety of forms from meditating to napping. Consider taking a relaxing bath, enjoying quiet time in nature, gentle stretching, or practicing breathing exercises to relieve stress. As the chart above shows, reading is a particular favorite for individuals 60 and older, but can be helpful for all age groups. It can help ease muscle tension and lower your heart rate. Consider picking up a favorite book for stress relief. Regardless of your age, stress can be overwhelming and come with serious negatives. However, you don’t have to figure out stress relieving methods alone. Our DC therapists can help you to pinpoint better, understand, and manage your stress. If you need help figuring out how to find a therapist in DC for your needs, we’ve created a guide for that.